With the Teachers Choice Teaching Clock, your young learner will be on the right track! Perfect for classrooms and your home, we created a teaching clock that will introduce the concept of time in an enjoyable positive way. Learning to read time will never be easier than with this clock. 10" x 10"
Battery Operated Analog Clock - AA Battery Included with Clock. 10 Inches by 10 Inches. Extra Features: From using colors that promote a positive learning environment to a clock face that is readable we added a few more features you will love. The clock is 100% silent(quartz) which is great for teachers who want to bring it into their classrooms. In addition to the silent movement, we used materials that are safe, nontoxic and durable. Rest assured your purchase will last for decades to come. Early Childhood Development: Give your young learner a head start with the Teachers Choice Teaching Clock. Our teaching clock has many benefits that will surprise you. The first benefit we are proud of is utilizing colors that promote a positive learning environment. Studies show certain colors greatly affect a child's mood which caused us to be very selective on what colors we used. Every detail of this clock has been optimized to have a strong learning impact. 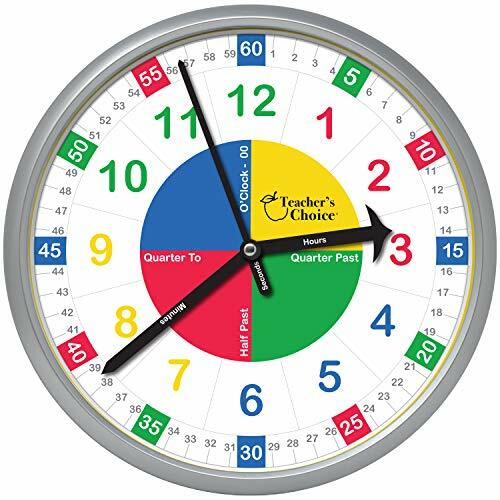 The clock is split in quarters so kids can easily learn terms like quarter past, half past, and quarter to. The hour, minutes and second hands are marked. 100% Money Back Guarantee: Buy our teaching clock without risk! We guarantee your complete satisfaction, or your money back. Hassle-free returns. If you have any questions about this product by Teachers Choice, contact us by completing and submitting the form below. If you are looking for a specif part number, please include it with your message. Carpets for Kids 9445 Literacy Sunny Day Learn and Play Kids Rug Rug Size: Oval 4'5" x 5'10"